Roger Schmidt’s pressing machine fell late on against a Barcelona side lacking the injured Lionel Messi. Taking the lead through a Papadopolous header, Leverkusen controlled the game for the majority of the 90 with strong central-dominance and the typical intense pressing. Travelling to Catalonia, Schmidt fielded a common 11 with Bernd Leno behind a defensive line of Donati, Tah, Wendell and the Greek goalscorer Kyriakos Papadopolous. Lars Bender and Christopher Kramer made up the 6 pairing and were flanked by the newly-signed Kevin Kampl and Hakan Calhanoglu. Karim Bellarabi was one of the star performers in the centre behind Javier Hernandez. Without their best player, Sandro took on his position on the right of the 3-man attack. Aside from this, the line-up was a fairly standard one though with Mathieu at left-back as opposed to Jordi Alba. Ter Stegen featured as Lucho’s goalkeeper with Mascherano and Pique ahead of him. The above-mentioned Mathieu took on the left-back slot with Dani Alves on the opposite touchline. Sergio Busquets was the 6 behind Rakitic and Iniesta rotating periodically in CM. The front 3 was 2-thirds complete with Neymar and Suarez in their usual positions accompanied by Sandro on the right. The clash of these two very distinct playing styles was always going to make this the highlight match and produced an interesting tactical battle between two of the top coaches in the world. Bayer pressing on a diagonal axis. Schmidt produced little surprise in his strategy out of possession and the side was organised in a highly-intense 4-4-2 with focus on occupying the centre and half-spaces. 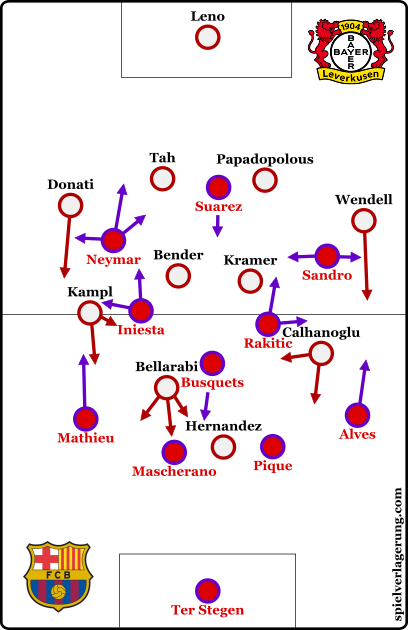 When pressing Barcelona in their 1st phase of possession, a key feature was the diagonal orientation of the movements of Bellarabi and Hernandez. 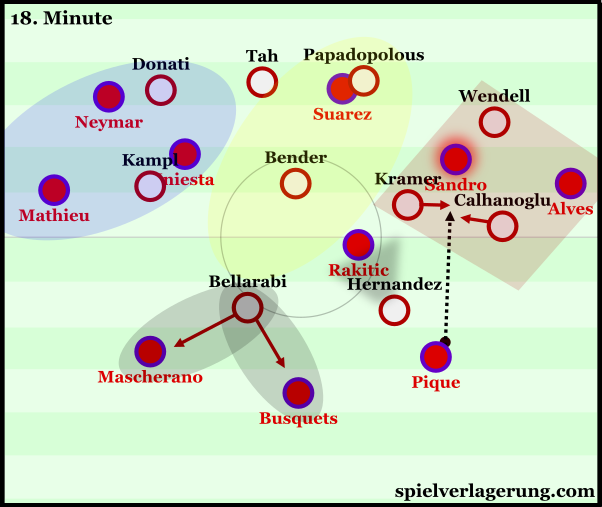 Using an option-oriented approach, Schmidt’s side looked to cut off the pass inside and show the ball towards the touchline, especially with Busquets as the option into the middle at 6. With the blocking of the diagonal passing lanes, Bayer restricted their opposition to access into the centre exclusively through vertical passing. As the recipient will then generally receive the ball in a weak body position with his back to goal, there is greater potential for traps through collapsing on the ball as opposed to that against different means of access. A key feature of the Bayer defensive strategy was their implementation of traps in various positions. Aside from the usual traps in the weak touchline areas, Leverkusen also looked to regain the ball by carefully-selected pressing traps in the half-spaces and in one or two occasions, the centre. On quite a few occasions, the away side looked more-than content to allow a centre-back to drive upfield towards the half-way line whilst cutting off all of his passing options into the midfield. They would then carefully orchestrate a trap by teasing a passing lane as shown in the example below where they allow a passing lane open to then quickly close it as the ball is played. Leverkusen’s trap to start a dangerous counter. Through inviting a centre-back forward, Barcelona ended up leaving space behind which Leverkusen could exploit should they regain the ball in a trap. Especially with Hernandez and Bellarabi, who possess intelligent movements and great pace to threat in attacking transition, their was always potential for Bayer to break through nearly-immediately after regaining possession. Schmidt’s approach in possession had little variation from their usual game. High focus on transitional play and verticality took centre-stage as they attack with intensity in their narrow shape. Both Kampl and Calhanoglu are suited to the inside roles they played and in coordination with Bellarabi and Hernandez created central overloads. Through this they didn’t necessarily succeed in making clean combinations through the centre of the pitch, but instead looked to make use of counterpressing as an attacking mechanism. An image from RM’s team analysis of the great Austrian side. Click on the diagram to be taken to the article. 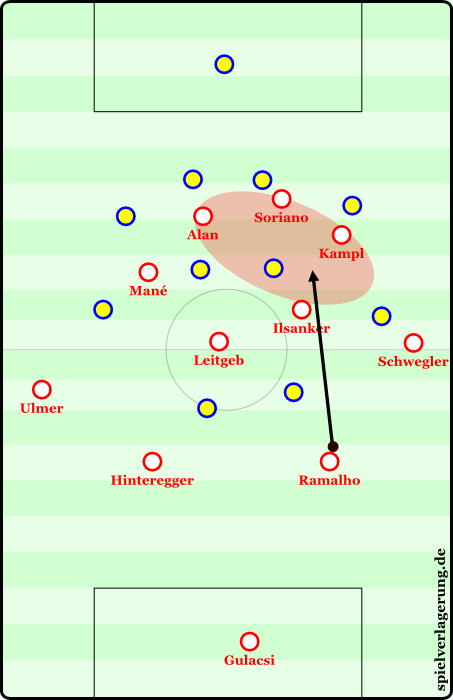 Especially in Salzburg, the use of counterpressing as an attacking strategy was a common feature of their model in possession. With a spatially compact 4 players in attack, Leverkusen frequently played direct vertical passes into the general area occupied. The first intention was generally to make a clean pass then break through with the overload but this is generally unrealistic and an unsustainable means of penetrating the defence. Instead, they would be entirely content if the pass was not completed and with the attackers close by, look to counterpress instantly to make an immediate regain and break through. Over the past year, a few teams have situationally employed this approach although generally it hasn’t expanded from Germany yet. It is an unorthodox yet generally quite effective means of attacking, especially when the technical ability of the attacking players isn’t at the desired level to make a clean breakthrough with a long pass. In addition, the action of so directly breaking into the opposition defense in a 4-4-2 is often quite difficult to the structure of the shape so this means provides another means of penetration as opposed to the more standard methods. The impact on the opposition is key, as many defenders will instinctively begin to move forward after witnessing their team win the ball back and thus the connections generally aren’t sufficient and the ball can be counterpressed easily. With defenders now out of position, spaces are further opened for the counter attack to be built and executed in. Such a tactic is suited well to players such as Karim Bellarabi and Kevin Kampl whose skillset in both attack and defence fit well. The ex-Salzburg player in particular is unsurprisingly strong at this through his experience under Schmidt before the coach left for the Bundesliga. Collectively the strengths of Leverkusen on the counter-attack means that this is a very well-suited means of attack for a side which Schmidt has developed very well over the past season. At half-time, Enrique looked to solve their issues in breaking through the centre by restructuring their midfield and attack. The attacking three became much more oriented to the centre of the pitch with an increased freedom to rotate between themselves. Suarez was still the most advanced in his positioning with Neymar playing just behind him, generally acting in the hole with aggressive movements from the left half-space. Once Jordi Alba was introduced in the left-back position, his occupation of the half-space became more a constant as he had less responsibility in producing width due to Mathieu’s deficiencies. Sandro was also inside in a more aggressive role and to the right of Suarez. With a more direct orientation, access to the young forward was at times lacking in comparison to his Brazilian teammate in attack. Collectively the shape became somewhat of a 4-1-2-1-2 with greater occupation of the central spaces. In the initial 4-3-3, the wider positioning of Neymar and Sandro meant that the home side struggled to have a telling presence in the middle of the pitch and thus were poor at establishing effective attacks. This was particularly key against a Leverkusen side whose defensive strategy is oriented heavily around central control, forcing the opposition to resort to wide play. 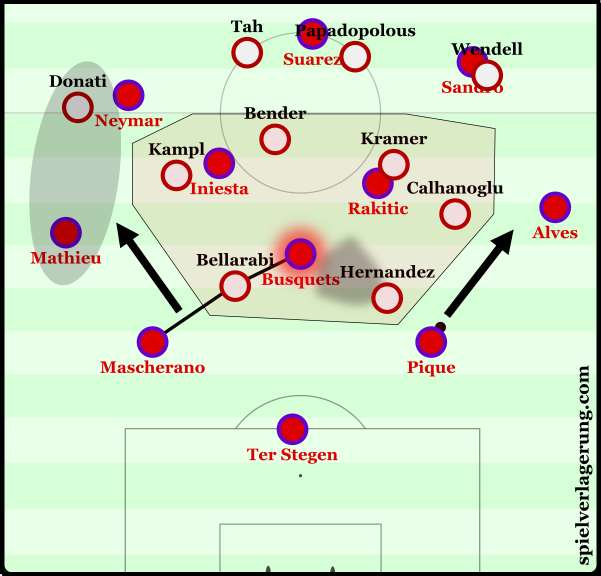 Throughout the first half, Barcelona frequently attempted to break through the middle 3 columns yet struggled as they were outnumbered by the compact 4-4-2 of the Germans. Barcelona’s improved occupation of the centre following their structural shift. The switch was relatively profitable as their access to the centre through mainly Neymar in the left half-space. Looking past his dribbling, which is what everyone knows him for, Neymar has excellent talents relative to collective-tactical elements and combinations with teammates. The latter in particular was more evident in the 2014/2015 season and his central shift highlighted these outstanding features of his game. Another under-appreciated feature of the Brazilian’s (which is possibly the reason for this ignorance) game is his work out of possession. Neymar’s pressing in general shows high intelligence aside from his athletic benefits and can use strong individual positional play and movements to be effective when defending. His counterpressing in particular is a strong feature and thus, can contribute well in the transitional pressing in the centre. 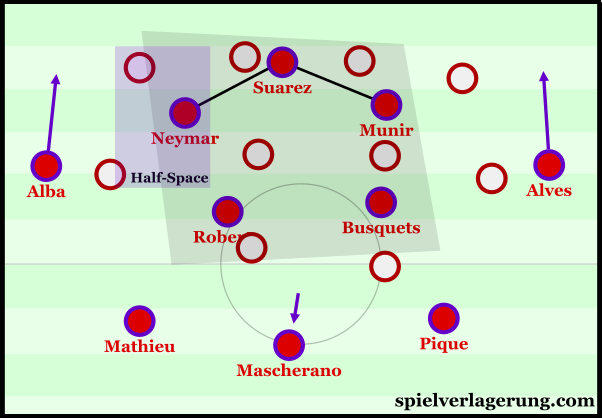 Against Leverkusen, Barcelona obviously have very strong opponents in this moment so the likes of Neymar are very useful – when the Brazilian was more isolated in wide positions, this aspect of his game was near entirely wasted. For the first 60 minutes of this brilliant tactical clash, Roger Schmidt’s team enforced a control over last-year’s winners through intelligent pressing and spatial occupation. 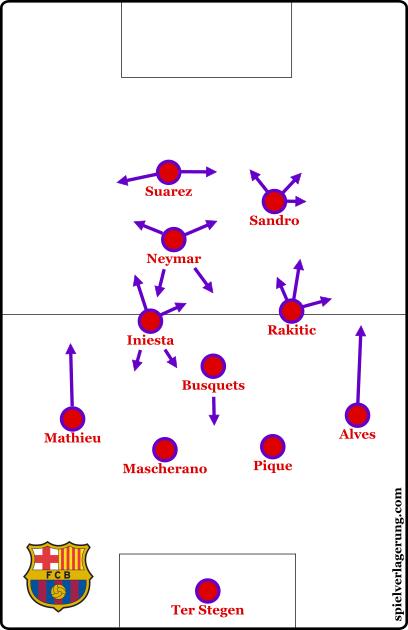 The (primarily) structural adaptations of Enrique swung the game in the Catalan side’s favour as the control shifted in their favour. Particularly the better integration of Neymar and his group-tactical abilities proved vital as their access into the centre benefited from it. One could argue that a failure to adapt to Enrique’s changes was also important in the final result though for the large majority of the game, Bayer Leverkusen more-than challenged a team which lifted the trophy last year. I am a 23 year old currently semi-professional football player from Spain with aspirations to become a football manager some day soon; I am currently coaching u-18s for my team, but that’s just the start for something bigger, I hope, when my playing journey gets to an end. I’m very interested in the type of discussion and analysis you provide on here. I just discovered the website, and been reading through the articles and I am really liking what you guys do. I chose to post in these article because I wanted to ask you about the importance of the drop in physical condition in Bayer Leverkusen’s midfielders in the second half and the lack of substitutions by Roger Schmidt to reinforce that area of the pitch. I personally think it was key in Barcelona finding a lot more spaces through the middle since (the very important and brilliant) Sergi Roberto sub, combined with the Jordi Alba one. Also, as a request or more like recommendation; I think a tactical analysis of Sevilla would be a very interesting and also challenging article for the writes and experts on this site, as well as very enriching for the readers, due to the tactical richness of, in my opinion, the best manager currently in Spain and his ability to change the team from match to match, even half to half, the difficulty for opponent managers to read their gameplan and overall success of his ideas throughout this last decade. Thanks in advance, you’re doing a very good job. Keep it up.